It is our greatpleasure to invite you to the Educational course with a topic “Decision making in practice” which will be held on 28th March 2019, in the Pharmaceutical Association of Serbia, BulevarvojvodeMisica Street 25, Belgrade. The aim of this course is to enable health professionals in Serbia to understand the basic principles of health economic theory and practice, and better understand how the application of health economic techniques and methodologies can improve healthcare decision making throughout Serbia in these challenging times. Educational course is intended for decision-makers, health policy makers, healthcare managers, pharmaceutical companies (in the sectors of market access, pricing, healthcare, regulation, marketing and sales, medical affairs), doctors and pharmacists working in the public and private sectors. Knowledge of English is necessary for the participation of this education. The course will be led by Tanja Novakovic and Mark Parker, directors of ZEM Solutions Ltd(http://zem-solutions.com).Tanja and Mark have international reputations in health economics and health technology assessment. They have a detailed knowledge of the practical evaluation of healthcare interventions across Europe and Serbia as well, that will enable participants to become familiar with health economic terminology and methodology within a real-world context and their application to enhance reimbursement and funding for medicines including cancer medicines. We are pleased to inform that Pharmacoeconomics Section of the Pharmaceutical Association of Serbia (SFE SFUS) is participating at 7th Serbian Congress of Pharmacists with a Session which main topic is: “HEALTH CARE DECISION MAKING FROM THE PHARMACOECONOMIC PERSPECTIVE”, which will take place in Belgrade on Friday 12th October 2018, Crowne Plaza Hotel, Belgrade, Serbia. It is our great honour to announce that Wija Oortwijn will held Preliminarry lecture on “VALUE FRAMEWORKS AND DECISION MAKING AROUND THE GLOBE”. Wija is the scientific secretary of HTAi’s Global Policy Forum: for 2016-2017 (on value frameworks), for 2017-2018 (on horizon scanning) and for 2018-2019 (on real world evidence). We are looking forward to welcoming at Session of the SFE SFUS of the 7th Serbian Congress of Pharmacists! Innovations drive increased spending in health care systems as new medicines tend to be priced higher than current standards. Financial stability, the main aim of the health system of CEE region, depends on two key challenges, which are how to best spend resources which are already in the system and the other challenge is should the health system have more or less money. To be relevant to decision making in the CEE region, HTA agencies must address these key challenges. MEAs are one part of addressing financial stability of health systems in CEE region. But MEAs should be applied together with HTA, so they can start to address clinical and economic uncertainties and provide a transparent and timewise framework for deliberative decision-making. However, this is challenging at the moment with typically confidential arrangements between companies and payers, as well as a reluctance among companies to make decision making more transparent as seen for instance in Poland. A lack of access to innovative health technologies is causing significant harm both in the region and globally, particularly in Serbia. However providing access to such technologies is politically and financially complex and challenging. We look forward to welcoming you to our future Conferences. "THE VALUE OF INNOVATION IN DECISION MAKING"
Conference program will be proactive and it will represent unique event in Serbia and region. The Conference program is intended for decision makers, makers of health policy design managers in health care institutions, employees of pharmaceutical companies (in the sectors of market access, pricing, health economics, regulation, marketing and sales), doctors and pharmacists who work in the public and private sectors. Participants of the Conference will have the opportunity to obtain new knowledge from world and local experts and exchange their experience and opinions. It is our great honour and pleasure to congratulate you on the jubilee of Pharmacoeconomics Section of the Pharmaceutical Association of Serbia, which marks 10 years of our section. I wish you all continued success in our future work! BB Soft informantor has published an interview where I discuss the challenges of health and pharmacoeconomics in the region, along with the development of the section, our activities and future plans. No city makes you feel more like a New Yorker than Belgrade. In Belgrade, people don’t walk, they amble; lunch spans the course of 3 or 4 hours; and drinks are sipped, never knocked back. Despite the slow pace of life, there’s still an unmistakable energy that bursts through the city. 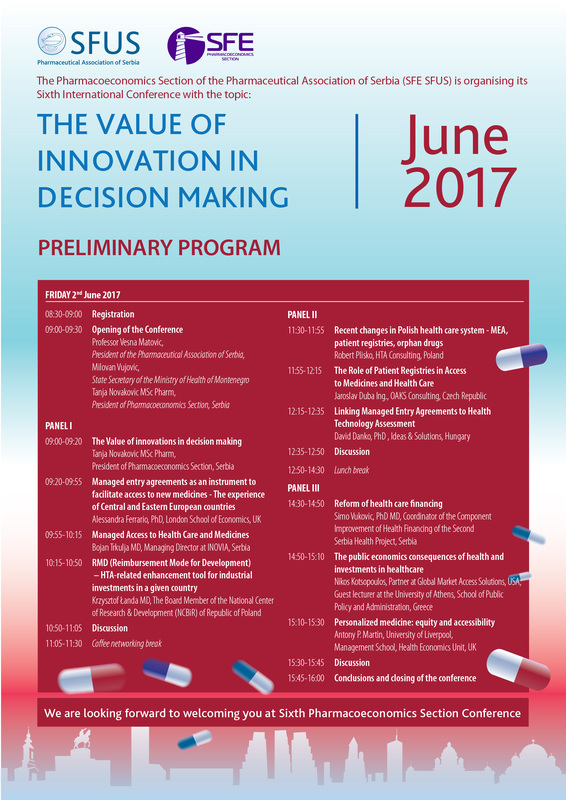 The preliminary program for the conference "THE VALUE OF INNOVATION IN DECISION MAKING" is now available. Use the link above or access from the menu in the top right. 2nd June 2017, Belgrade, hotel Metropol, Serbia. ARE WE READY FOR BIOSIMILARS? • exchanging experiences and knowledge with experts from the region and international stage. Šibenik, Croatia, from 23rd to 26th April 2015. This year focus will be on the following subjects: 'The role and impact of pharmaceutical industry on the general economy in countries in the region' and 'The need to adapt the model for health technology assessment in countries with high risk of sustainability of healthcare financing in order to ensure transparency and competitiveness'.